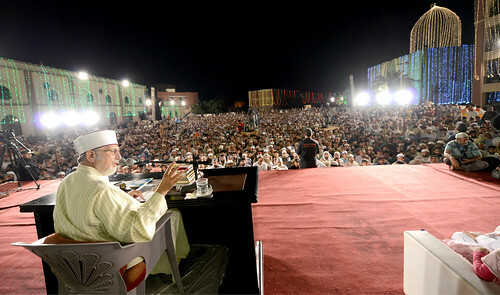 Thousands of people would join Itikaf city under the patronage of Shaykh-ul-Islam Dr Muhammad Tahir-ul-Qadri on Friday evening (September 11, 2009). This is the biggest ever collective Itikaf gathering in the Islamic world after that of the Two Holy Mosques. These views were expressed by Secretary General of MQI Dr Raheeq Ahmad Abbasi in his press conference regarding the preparations of the Itikaf city scheduled to be held in Jamia al-Minhaj, Lahore. Sheikh Zahid Fayyaz, Ahmad Nawaz Anjum, Jawad Hamid, Allama Shahid Latif Qadri, Muhammad Aaqil Malik, Shahzad Rasool Qadri and Mian Zahid Islam were also present on the occasion. He said that a large number of people from abroad would also participate in the Itikaf and some of them have already started reaching. Minhaj-ul-Quran International’s Directorate of Foreign Affairs has made arrangements for their stay as well as ‘Sahri’ & ‘Iftari’. Vast arrangements for performing ablution and cleanliness have been made in the Itikaf City. In addition to the official security, 2000 men of Minhaj Youth League and Mustafavi Students Movement would also perform the security duty. 700 women would also be deputed to take care of security-related matters in the Women Wing of the Itikaf City. Dr Raheeq Ahmad Abbasi told that 25 and 15 medical units have been established both for men and women respectively, whereas a team of 50 doctors would remain present during the whole span of Itikaf. The medical health units would have the facility of every kind of treatment. 5 ambulances would also be present in the Itikaf Gah. The leaders of MQI thanked public utilities like PHA, WAPDA, WASA, Police, and district administration for their cooperation to make the Itikaf city a success. They hoped that these bodies would continue to provide their help. Dr Abbasi said that elaborate arrangements for the cooking of food have been made where the cooking would be done in two shifts with more than 300 people working there. He told that arrangements were also in place to show the keynote speech of Shaykh-ul-Islam Dr Muhammad Tahir-ul-Qadri on huge LCD screens. Stalls of his CDs, DVDs and books would also be put up and special concession would be given to the participants of the Itikaf city. MQI Secretary General said that lists of thousands of people from across the country who got themselves registered have been compiled and selection of people from the general masses was also done through a draw. The central registration camp has been shifted to the Itikaf City for the registration of incoming participants wanting their registration on the occasion.